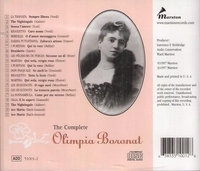 "The Marston CD is the first to appear of Olimpia Boronat, and her delicately shaped phrases and expressive ritards certainly evoke another era. Her elegance and charm seem to belong to a time when the singer was intimate with select audiences. Boronat's vocal line has elasticity. She shades her tones in such a way that the voice seems to move forward and recede as she forms a phrase. Tosti's 'Senza l'amore' is shaped in this manner, filled with light and shade. The result is pure magic....She has the ability to make you listen to the over-familiar 'Last Rose of Summer' as if you've never heard it before. Only a great singer could accomplish this. Ward has produced marvelously clear transfers." “One summer at the Château-de-Fleurs the Italians presented IL BARBIERE DI SIVIGLIA with Olimpia Boronat in the rôle of Rosina. A remarkable singer, she was, as distinguished wife of Count Rewuski, one of the landed gentry in Kiev province and enjoyed a comfortable life both in Kiev as well as on her own estate. Like many other Italian singers, she had in her repertory a few concert numbers in mutilated Russian.... First place among them was, of course, Aljabev’s 'Nightingale' which she often sang in Rosina’s singing lesson scene. The audience demanded ‘Nightingale’ and she always gave them what they wanted. Without further ado, she walked to the wings and, in a charming, clear voice, asked the director to go fetch the sheet music to ‘Nightingale, My Nightingale’ from her dressing room. There was a pause of some long three minutes, in the course of which she, with a coquettish smile on her lips, addressed the audience two or three times with a reassuring ‘uno momento’. When her music was brought to her, she waved the sheets at the audience, ran to the piano, put the music down before Don Alonso….